The Seal of Solomon is a meteorite crystal which was used by King Solomon's priests, who were commanded by King Solomon to "bind his seal" with a jewel from the cosmos. The seal was stored with Solomon's treasure where it would stay hidden until it was found in what is known as modern-day Israel by the Men of Letters in 1917. The seal was then taken to Portsmouth, Rhode Island, where it was stored in a chapterhouse known as Capitulum 7. Diego Avila calls forth Yokoth. In 1925, a rogue sect of the Men of Letters in the Portsmouth, Rhode Island, chapterhouse, led by Diego Avila, used the Seal of Solomon to create a rift to bring forth the cosmic deities Yokoth and Glythur to make the Earth into a new paradise. Yokoth was able to successfully cross over, taking possession of her sacrifice, Sandy Porter. Yokoth then eats Diego and many of the members present before she is bound to the altar and the rift is closed with the Seal of Solomon. Glythur is sealed away in his world before he could cross over. In 2018, Yokoth is unintentionally released by Sam and Dean Winchester who came to recover the Seal of Solomon. After feeding, Yokoth takes Dean back the chapterhouse, where she plans to open another rift for her mate Glythur to come through and use Dean as his vessel. As Glythur's tentacles breach the rift, Dean is able to avoid being possessed. Freeing himself, he takes the Seal of Solomon from Yokoth and tosses it to Ophelia who uses it to seal the rift, sending Glythur back to his universe, dragging Yokoth with him. 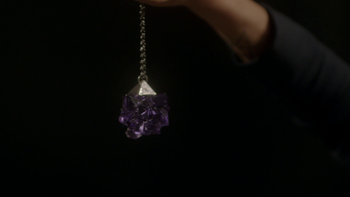 The seal is then given to the Winchesters by Ophelia and Marco who explain how to open the desired rift for 24 hours. Back at the Men of Letters Bunker, Dean gathers the ingredients for the rift-opening spell. Using the seal, Sam is able to open a doorway to Apocalypse World in the Bunker library for 24 hours and Dean enters alongside Ketch to try and retrieve Mary and Jack. The Seal of Solomon can be seen on the desk when Rowena prepares to open the rift, although she doesn't use it due to her strengthened powers substituting its rift opening abilities. The Seal of Solomon is known as a magical signet ring that was engraved by God and given to King Solomon. It gave him the ability to control demons and djinn as well as communicate with animals. This page was last edited on 5 January 2019, at 21:12.